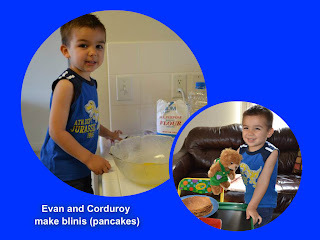 Corduroy’s Adventure with Evan started with a week of Blini (pancakes). This is a traditional Russian food for “Maslenitsa,” a holiday to celebrate Spring. Of course Corduroy dipped his in honey. Corduroy met Evans grandmother Natasha who lives in Russia. She read books to them via SKYPE.